Imagine having three destinations in one; each of which offers beautiful, isolated beaches that can be accessed by 4WD and walked on with next to nobody bothering you. You could ‘toss a line in’ to the crystal clear South Pacific Ocean, with full expectation of catching lunch or dinner, or you can lace up your hikers and hit the scrub for a relaxing, healthy walk through the many miles of single tracks up and down the coast line. Yuraygir National Park offers those three beaut locations in its northern, central and southern sections, each of which could be a complete holiday; leaving the others for next time or you could do the drive between all three to take in the 65km of pristine coastal views. You can’t drive (4WD or otherwise) directly from one section to the other. Rather, a trip back out to the snaking Pacific Highway is needed, so that does take a little of the shine off when trying to visit all three sections as it’s a fair drive between all three once you’ve completed the loops in and out. If you’re on a mission to see as many great spots as possible then just do it, you won’t regret it. If on the other hand, you’re after plenty of rest and relaxation, then pick one, explore all it has to offer and return on your following holiday to the next section. Each has its own unique scenery, some with more access to facilities, some where you need to be totally self-sufficient, but all offer absolute winning locations. Be sure to take all your toys when visiting Yuraygir National Park; fishing rods, canoe, surf board, camera, scuba or snorkeling gear and binoculars for all the wild life you’ll spot. Oh and don’t forget to bring plenty of spare time to use them all! Boats; either roof toppers or trailer, can be taken into most areas, as can camper trailers or off road vans. The only section you may have difficulty towing is in the southern section while trying to get to Pebbly Beach camp ground as there is a tidal crossing to tackle, with a steep sand bank on the northern exit. Wait for low tide and walk the water and sand bank first so you’ll know what you’re up against as the conditions do change regularly. If you’re into all things feathered and furry, there are supposedly a plethora of different species to spy on. Apparently there are eastern grass owls and rabbit-sized Rufas Rat Kangaroos roaming the park. I only spotted a long-legged 6 foot tall bush chook (a coastal emu they tell me) and a muscle bound roo that stood head and shoulders over me… which made me run faster than the emu when it stood up for a flex and scratch! Anyway, for all I know, the said small creatures do exist, I just didn’t know where to look or what they look like. The northern section of Yuraygir is the longest section and has to be accessed from two points to fully appreciate it. Head in through Yamba (another great stopover in itself) and you’ll drive through Angourie for a dip in Blue pool and Green pool – both of which are disused quarries since their natural filling of water many years ago. Both pools offer brilliant swimming within the rocky coast line. There’s Mara Creek picnic area, with a walk to Dirrangan Lookout and Little Shelley Beach, but no vehicular beach access and no camping up here – other than back in Yamba. Grab yourself some local prawns if you do happen to stop of in this beaut town; we gorged ourselves silly with half a wheelbarrow full. Oh, and a little dipping sauce while you’re at it… and a nice cold drink…and a warm day on the white sands in front of the ocean. Damn, life doesn’t get any better than this. Heading into this northern section through Maclean and Gulmarrad, you’ll then have a few camping options of Lake Arragan, Red Cliff, Grey Cliff which are to the North of Brooms Head, or South of town at Sandon River Camping area. All of these camp areas offer beach access for your 4WD, basic facilities at camp, as well as plenty of beach and inland walks. In years gone by, the red cliffs of this area were used by sailors to get their bearings while at sea and it’s from on top of these (and at Grey Cliffs) that provides a great viewing point to spot dolphins and whales during the season. When heading to the historic fishing village of Sandon, be sure to walk across to Plover Island at low tide, but don’t get caught with the tide coming up as you’ll have a long wait to get back to camp. Boating up the Sandon River will provide more scenic delights as well as the chance to fish for fresh water species and (providing you have an adequate boat) be able to head into the open waters of the Southern Pacific to land the salties. There’s also a camp ground here that overlooks Plover Island. It’s the Sandon River that prevents vehicular traffic heading south into the central section of Yuraygir National Park and the best spots for top-ups of fuel, food and drinks are at Yamba or Brooms Head. The central section of Yuraygir National Park is accessed from Wooli Road (from Ulmarra), then Minnie Waters Road (to Minnie Waters) or Wooli Road (to Diggers camp and Wooli). One camping spot in the central section is at Diggers camp, which has basic facilities. From here you can walk south across Bare Point, Wilsons Headland and along the beach all the way to Wooli. There’s beach access for your 4WD just south of the picnic area at Wilsons Headland. Heading into Minnie Waters, there’s another camp spot just north of town at Illaroo Camping area, which is where the Angophora Grove Walk can be found. There’s plenty of beach to explore north of the head land, which takes you back to the southern side of the Sandon River – remember you were over there while in the northern section of your visit? There’s also a caravan park at Minnie Waters, which offers plenty of facilities at good rates and you’ll still be close to all the natural beauty of the area. In fact, the park is nestled right amongst the bush land with easy beach access and better facilities than the National Park, so it’s a great alternative to pooing in a drop dunny. There’s a general store where you’ll be able to re-fuel and stock up on basic foods, drinks and even a selection of fresh seafood take away if you haven’t been able to bag your own. While the southern section is the smallest of Yuraygir National Park, it offers one of the better camp grounds at Pebbly Beach. Once you’ve left the bitumen of the Pacific Highway, driven the dirt roads of the Barcoongere Forest Way, you’ll exit onto the main beach. 2WD’s and low clearance vehicles may have to take the alternate access roads in some sections to get to the beach front. Heading north, you’ll be stopped by Station Creek, which is tidal and salt water, so you may have to be patient while you wait for a suitable wading depth to gain access into Pebbly Beach camp area. If you do need to wait – it’s a great spot for a swim or canoe up stream. If you turned south at the main beach exit, you’ll get to the small town of Red Rock. Once through the water crossing and up the steep sandy bank, the campsite is just a few hundred meters away and offers plenty of flat, grassy spots to pitch tents or set up camper trailers. There are good toilet facilities here and plenty of shade to relax under. As the name suggests, Pebbly Beach is full of… pebbles – or small, smooth, flat stones, that are just perfect for skipping across the water’s surface. A great past time that’ll fill many hours of searching for that perfect stone to chuck. The way I’ve always tried to explain geology to my little kids are that, according to rock doctors there are only two types of stones in the world – skippers and plonkers. Skippers, well they are obviously great for skipping. Plonkers, well…ummm… they’re either ones that you know won’t skip, or ones that didn’t skip when you thought they would. Confusing maybe to adults, but that’s my best way out of not getting at least one skip out of a perfectly smooth and round stone. Kids get it… ‘cause dads are always right! Walking to the northern end of Pebbly Beach is where you’ll find the best sand and the best spot for a swim and fish from the beach, as it’s protected by the headland. Take a picnic with you and you’ll easily spend the day in this beaut little corner of paradise. For those with roof toppers or trailer boats, there’s beach access via a small sandy track half way between camp and the river crossing, or cross the river and launch off the main beach. Yuraygir National Park was created in 1980 with the renaming and combination of Angourie National Park and Red Rock National Parks, plus extra small deposits of land have been added over time to create one of the longest stretches of coast line in NSW that has remained undeveloped. The park offers campers and 4WDers a great place to get away from it all, while not being too far off the beaten track – perfect for a family get away, a hiding place for couples and even a place for the boys to set up camp, fish and surf the days away, while enjoying the soothing and mesmerizing effects of an open fire at night. While you don’t have to pack for an epic outback journey to get to Yuraygir National Park, once you’ve laid claim to your patch of ground, you’ll no doubt feel like you’re a million miles away from the big smoke. What more could you ask for…other than to actually land one of those ripper fish your mates always talk about? Expert fisho or not, you’ll know you’ve backed a winner once you’ve laid you’re goggles on this place. In northern NSW, Yuraygir National Park stretches a 60km length of the coast line, from just south of Yamba down to about 45km north of Coffs Harbour. Depending on which of the three sections you head into, it’ll only be a short to medium drive off the Pacific Highway. If you’re coming from the West, Grafton is the place you’ll have to decide whether to head North or South to get into your desired section of the park. There are National Park camping grounds in all three sections of the park. 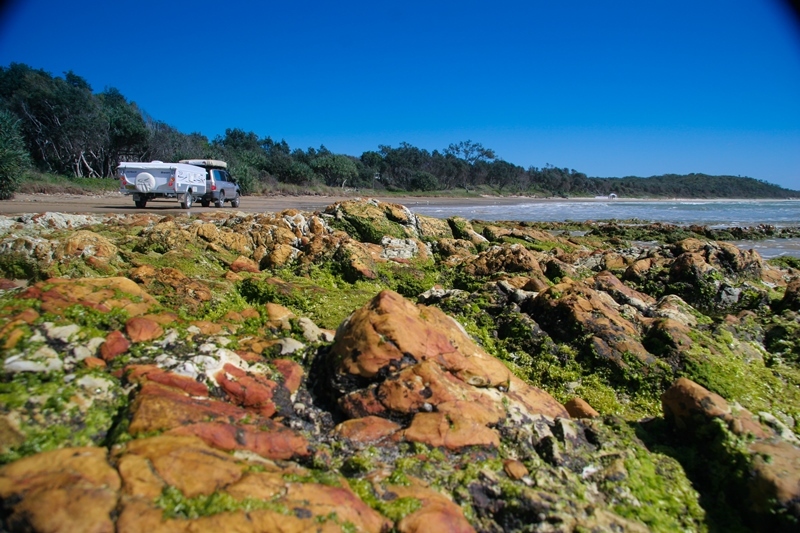 The towns of Yamba, Brooms Head, Sandon and Minnie Waters also offer caravan parks. The National Park camp sites are generally adjacent to the beach and most have toilets. Yamba to the North, Grafton, when coming from the West, or Coffs Harbour and Woolgoolga down South are the prime shopping spots before getting into the smaller towns of Brooms Head and Minnie Waters. Minnie Waters has a beaut little general store that also sells lollies the old fashion way in paper bags at a couple of cents each, take away food, alcohol and a few other knick-knacks. No bookings are taken for camping in Yuraygir National Park. Once you’ve set up camp, a contractor will visit to collect fees of $10.00 per adult, $5.00 per child, plus $7.00 per car – all per night. No permits are required to 4WD on the beaches. 2WD – forget getting into the best spots, but you will be able to get about the towns and gravel roads. 4WD – Most 4WD’s will be able to negotiate all this park has to offer. Towing anything into Pebbly Beach camp site will be difficult up the sandbank, but conditions vary considerably. Lowering tyre pressures when on the sand is a must. Motorhome – On road motorhomes will get to the same beaut spots as cars, but will miss out on the best unless you’ve got a 4WD variant. Caravans – Vaners can take all their comforts with them as there are van parks at all three sections. You’ll be game trying to get into Pebbly Beach with a van, but it is doable.